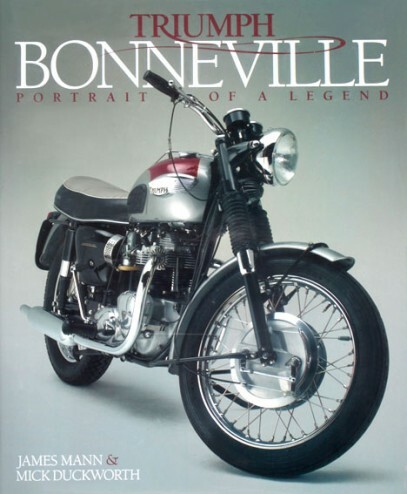 The Triumph Bonneville has been one of motorcycling's most enduring British icons. The name comes from the Utah salt flats where a streamlined twin-cylinder Triumph captured the World Motorcycle Speed Record in 1956. In 1959, the first Bonneville, the T120, appeared, and the Bonneville name would remain a revered badge of motorcycling honour for the following three decades. This elegant, picture-lavish book, featuring Bonnevilles specially photographed in a studio setting, pays tribute by showing all the classic models in exquisite photographic detail, accompanied by an expert commentary. This is a visual feast for all Bonneville enthusiasts. For a full price copy signed by the photographer buy here P &P from £2.80 for UK delivery only please add this amount to your paypal transaction.Contact JM for expedited delivery. To buy through Amazon click here.